This interesting surname is a patronumic of Allen, which is of Celtic origin, and derives from a personal name of great antiquity. The name 'Alan', is thought to derive from the Gaelic 'ailin', little rock, a diminutive of 'ail', rock, and was introduced into England and later to Ireland by the Breton followers of William the Conqueror after 1066, among whom it was a very popular given name. One man in particular is credited with being the first of the name into England; Alan Fergeant, Count of Brittany and a companion of the Conqueror, and later first Earl of Richmond in Yorkshire. The personal name is recorded in its Latinized form of 'Alanus' in the Domesday Book of 1086, although the surname is not recorded until the first half of the 13th Century, as below. 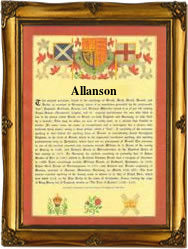 The modern surname can be found in a variety of forms; Allen, Alen, Alleyn, Alleyne, Allain, Alan, Allan, Allin, Allon, FitzAlanand the patronymics Allanson, Allenson and Alli(n)son. The marriage was recorded in London of Radulphus Allanson and Elyzabeth Goode on September 30th 1583 at St. Martin-in-the-Fields, Westminster. The first recorded spelling of the family name is shown to be that of Geoffrey Alein, which was dated 1234, The Cambridgeshire Feet of Fines, during the reign of King Henry 111, 'The Frenchman', 1216-1272. Surnames became necessary when governments introduced personal taxation. In England this was known as Poll Tax. Throughout the centuries, surnames in every country have continued to "develop" often leading to astonishing variants of the original spelling.